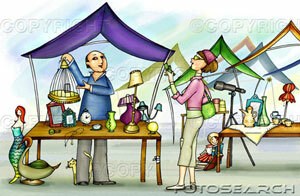 The Flea Market is your place to buy, swap, sell, or give away stuff. Got a car you don’t need? Put it on the Flea Market! Need a new couch? Find it on the Flea Market! The Flea Market airs weekday mornings from about 10:00 until 10:20 on 101.7 WGOG. We will mention emailed and faxed items when we can, but please keep in mind that the only way to guarantee that your item will be mentioned on the air is to call in during the show. There is a three item limit PER DAY on Flea Market ads. Flea Market items will not be taken by phone outside of our show times. The Flea Market is for INDIVIDUALS ONLY. Absolutely no commercial businesses. If you are a commercial business and are interested in advertising on 101.7 WGOG, please call 638-3616. WGOG or its employees are not responsible for claims made or items purchased on the Flea Market. Please do not call during the show to inquire about a phone number you missed. Listings are made available the same-day here. Yard Sale calls are accepted during the show on Fridays ONLY.